FULTON, NY – Representatives of Cayuga Community College Fulton Campus present Gail Cooper (left) of Catholic Charities of Oswego County with items the school collected in support of the agency’s Emergency Services Program. 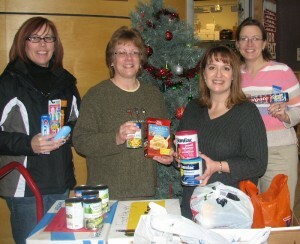 Students, faculty, and employees generously donated a variety of food, formula and personal care items. The donation will help re-stock the pantry’s shelves for the winter after a busy holiday season. Catholic Charities’ Food Pantry serves families throughout Oswego County. From left are Cooper, director of Fulton Operations, Sue Witmer, Loralee Lardear, and assistant registrar, Rebecca Devendorf.